This is a great time of year to be a kid. Unless you have an earache. Between end-of-the-year class parties and watching a lot of movies at school to pool parties and the promise of summer fun--being a kid right now is the bomb. Unless you have an earache. Which my poor baby Wade had last night. When my oldest Peyton was a baby and had earaches, I remember feeling bad for him, but not really understanding. Not understanding why he was flipping the f^#@ out over a little earache. Then I got an earache and I understood. Babies flip the f#&@ out over earaches because they are immensely painful. When my ear hurt I was beyond miserable. It was like labor pains, I am not exaggerating. I needed an epidural. So, when Wade started flipping out and grabbing his ear, I didn't judge. I held him, distracted him, gave him ibuprofen. Last night was long. Just when I thought "okay, pain is gone, sleep will come," another wave of ear pain came over Wade. And he resumed his flipping out. But I know he will get better, I will sleep again someday and Wade will get to partake in one of the happiest times of year to be a kid. The new Capri Sun Super V commercial sums up how I feel as a mom. I'm pretty good at giving my kids freedom to make mistakes and learn some things on their own. I wouldn't call myself overprotective. But it isn't easy, I do a lot of holding back. The fireworks display in the grocery store is a sure sign of summer. And I love it. TV is going to be good next week. I've been waiting over 20 years for this. The new Dallas starts next week, June 13 on TNT. I'm nervous about setting my expectations too high and being let down. But come on, Larry Hagman, Patrick Duffy and Linda Gray together again? It's got to be good, right? I am obsessed with avocados. I've always loved them, but now I really love them. From homemade guacamole, cut up in salads, on top of burgers...I.love.avocados. Click here for a great homemade guacamole recipe. Twitter is fun. Come play with me, Click here to follow me @AngelaYBlood. Comments are good. 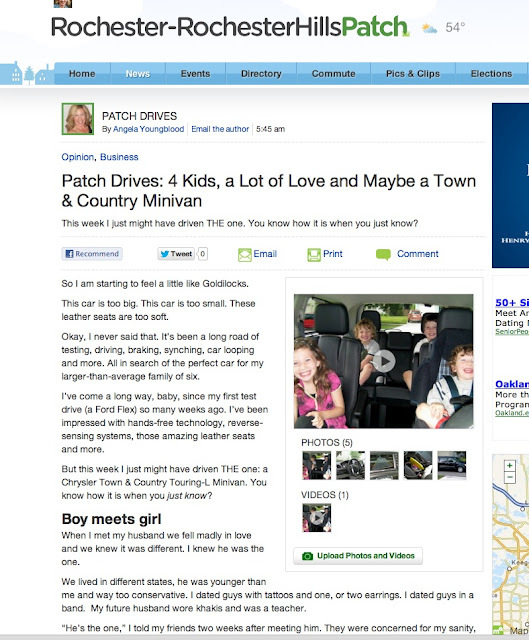 Come on over and comment on my last car review for Patch. I think I found THE one. Click here to read all about it.